With the rise of the amount of data stored in servers, the demand has also risen for data engineers to help manage the vasts amount of data now available to us. 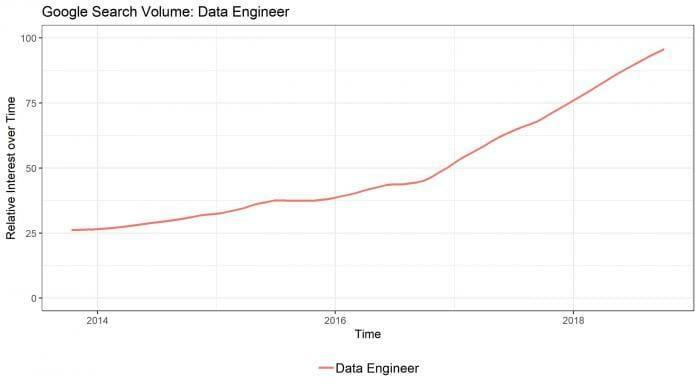 Data Engineers are in high demand, and Google trends have shown that the global volume of the search term “Data Engineer” has tripled since 2014. More and more people are seeking skilled data engineers to help manage the vasts amount of data stored across the globe, and we collected salary data to calculate how this increase in demand has impacted their earning across Europe. We collected salary data from Glassdoor from 10 countries in Europe. People often don’t like to disclose their salaries - but through using Glassdoor we can gain an understanding of what firms across Europe pay their workers, using self-reported salary information by location and employer. We collected the data available for people across Europe with “data engineer” in their job title across Austria, Belgium, France, Germany, Ireland, Italy, Netherland, Spain, Switzerland, and the UK. To make salaries comparable, we changed them into annual salaries in Euro (GBP/EUR: 1.12, CHF/EUR: 0.88). The graph shows nominal salaries per year and by country. 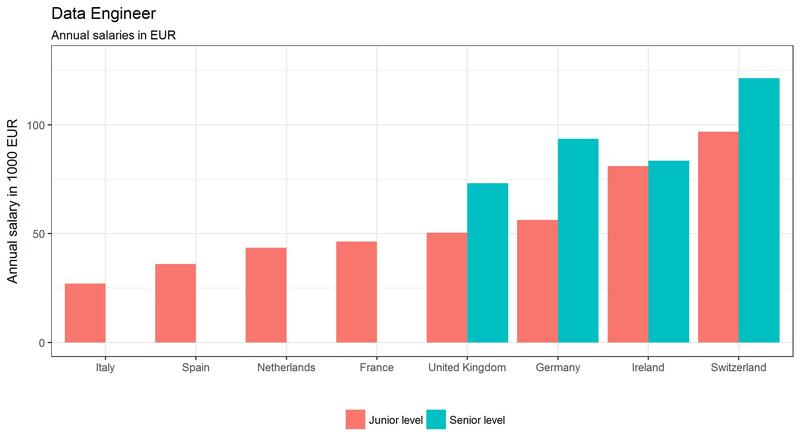 Junior salaries range from EUR 27,000 in Italy for a junior data engineer, to almost EUR 100,000 in Switzerland. For senior level data engineers, Switzerland pays the most in Europe with almost EUR 125,000, followed by Germany in second with EUR 90,000 and then Ireland with around EUR 75,000. Nominal salaries don’t really tell us much about underlying purchasing power - Switzerland and Germany pay the highest wages, but these countries also have a higher cost of living. The OECD price level index takes into account the local price index and computes real wages. The table shows the average annual salary for junior level positions, with the cost of living taken into account. It shows that the cost of living in Switzerland is much higher than other countries - almost 70% higher than Spain. With that taken into account, the salaries change slightly - Ireland takes over from Switzerland as the leading country in terms of pay for data engineer, and Italy keeps its ranks as the European country with the lowest pay.